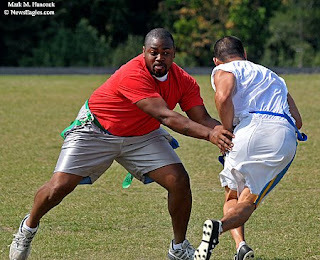 Kamikaze's Rashad Hope (left) grabs the flag of Sinners And Saints' Eddie Lin during a flag football league game at Emmett Conrad High School in Dallas on Saturday, Sept. 27, 2008. 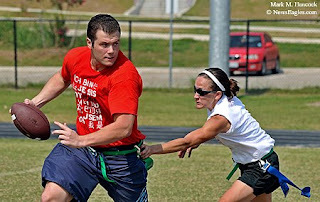 Sinners And Saints' Chelsea Baird (right) reaches for the flag of Kamikaze quarterback Byron Hudson (left) during a flag football league game. 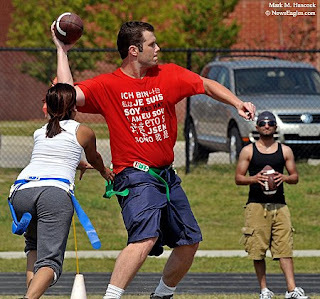 Flag football leagues are an economical physical fitness and social alternative. 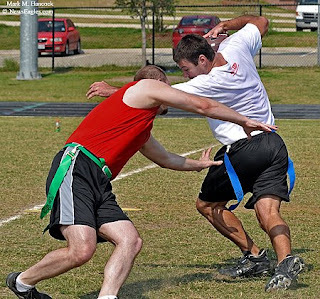 Sinners And Saints' Justin Klein (right) avoids a tackle by Kamikaze's Scott Miller (left) during a flag football league game. With little more than a team-colored T-shirt and a pair of cleats, anyone can play league football. 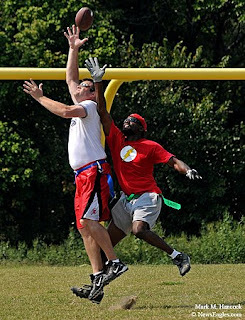 Eight Is Enough's Jeff Jaussi (left) and Kamikaze's Magnus Staggers (right) leap for a pass during a flag football league game. Eight Is Enough's Jasmine Hussain (left) dives for the flag of Kamikaze quarterback Byron Hudson (right) during a flag football league game. 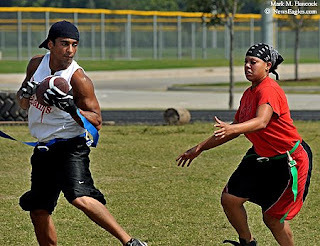 Sinners And Saints' Tamer Ahsan (left) intercepts a pass intended for Kamikaze's Stephanie Sims (right) during a flag football league game at Emmett Conrad High School in Dallas. Boyd High School basketball player Morgan Brownlee tries to find an open lane during a pick-up game after school in McKinney on Tuesday, Sept. 14, 2008. 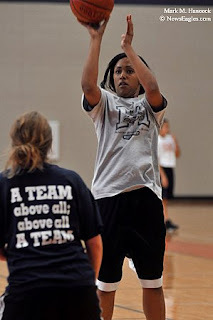 Boyd High School basketball player Morgan Brownlee makes a jump shot during a pick-up game. Brownlee was diagnosed with scoliosis at age 12 and was told she would never play basketball again. Boyd High School basketball player Morgan Brownlee works on her free throw after school in McKinney. Since her diagnosis, she had surgery, went through a rehabilitation program and gained a rod and screws in her back. 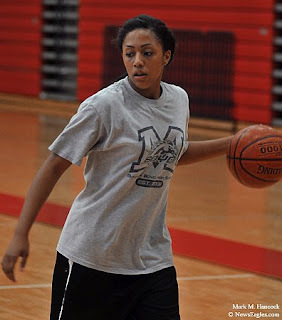 She's back on the court and plans to play for the school this year. Please read, "Rehab after scoliosis surgery worth it for basketball player" by Nancy Churnin / The Dallas Morning News. According to the NPPA, "A new law goes into effect on November 24, 2008, which will require all workers on federal highways to wear high visibility safety apparel, which apparently also includes photojournalists who are there to cover news." Although there's no specific Fed fine, the states are likely to make some quickly because their funding could be cut. Although the initial report states federal highways, it's been clarified to mean any roadway even partially financed by the U.S. DOT. This means most roads. Additionally, the apparel must be ANSI Class II safety gear used in high-speed environments. Class II tends to be high-visibility yellow with more reflective banding. NPPA suggests a vest offered through the National Newspaper Association with "PRESS" and the NNA logo printed on the back for $15 each. I contacted an NNA rep and they only take orders by phone. I ordered a vest through Utility Safeguard. They have a secure online order process and offered custom printing. I opted for "PRESS" as well. It costs a few bucks more, but I'll be so stylin'. Eric Chapa (No. 00) kicks the ball for a goal during a soccer game at Richland College in Dallas on Saturday, Sept. 20, 2008. 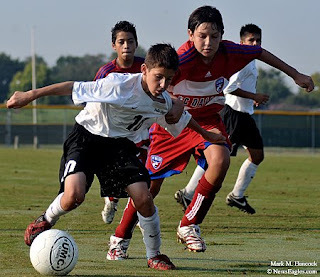 Chapa, 13, is a member of the U15 U.S. youth National Team and will travel to Mexico. Emerson Hyndman (No. 10, left) gets held by Davin Suominen (No. 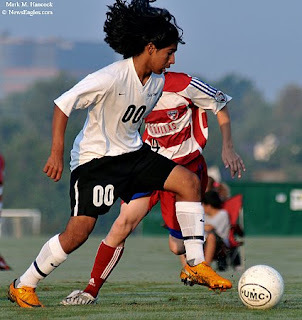 1, right) during a soccer game at Richland College. 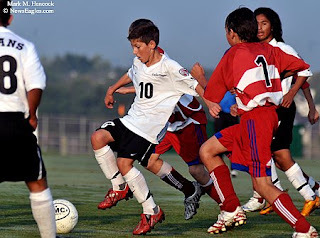 Hyndman is a member of the U15 U.S. youth national team. Eric Chapa (No. 00) dribbles the ball during a soccer game at Richland College. He plays internationally in an older age group. Emerson Hyndman (No. 10, center) passes the ball as Davin Suominen (No. 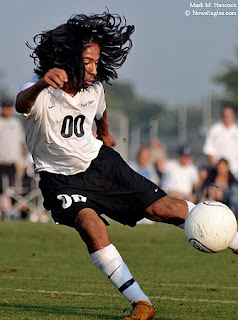 1, right) approaches during a soccer game at Richland College in Dallas. Hyndman is the grandson of Schellas Hyndman, FC Dallas' head coach. For folks within a day's travel of New York City, the 25th annual PhotoPlus International Conference + Expo sponsored by Photo District News (PDN) looks like it's worth the trip. The event is taking place at the Jacob K. Javits Convention Center in New York from today until Saturday. If I lived close enough, I'd attend. The event features hundreds of exhibitors, more than 100 seminars, various photo galleries and all the goodies we PJs love to have in our bags. The event charges $49 for the expo only or a one-price-for-everything fee of $79. This is a write off for pros and is still cheaper than the Flying Short Course. I got a request from a Nikon rep to promote the Bill Eppridge presentation. It's at 4 p.m. on Friday. 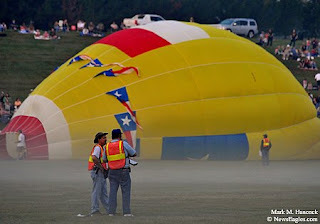 Colorful balloons are muted to mere tones as they arrive with the sunrise during the annual Plano Balloon Festival at Oak Point Park in Plano on Sunday, Sept. 21, 2008. 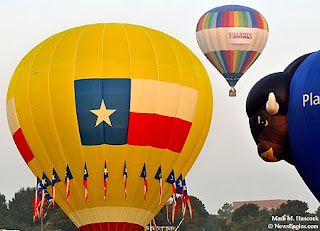 Roxie Morrison, Jean Edwards, Adam Morrison and Sam Edwards stretch the Texas Twist balloon envelope before dawn during the annual Plano Balloon Festival. Texas Twist crew chief Jean Edwards (left) of Austin and crew member Adam Morrison (right) of Dallas have a laugh as they wait to launch at Oak Point Park. 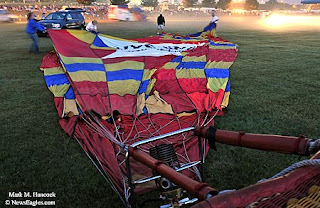 Colin Sledge (left) and Doug Page (right) with the Plano Amateur Radio Club observe pre-dawn activities as Lone Star, piloted by Kevin Thompson of Hurst, inflates at Oak Point Park. 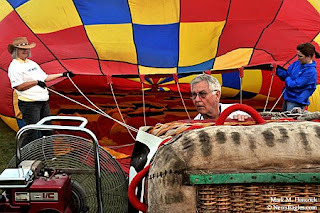 Texas Twist crew chief Jean Edwards (left) and crew member Roxie Morrison (right) hold the balloon envelope open as pilot Sam Edwards of Austin (center) prepares to inflate the balloon. 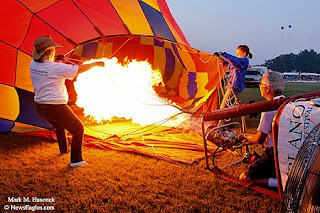 Texas Twist crew chief Jean Edwards (left) and crew member Roxie Morrison (center) hold the balloon envelope open as pilot Sam Edwards of Austin (right) inflates the balloon with heated air during the annual Plano Balloon Festival. 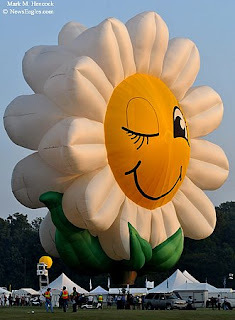 Miss Daisy, piloted by Daniel Stukas of Central, S.C., greets the sunrise and prepares to launch during the annual Plano Balloon Festival. 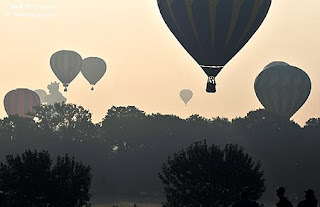 Sponsored balloons including The Dallas Morning News, piloted by Dean Donley, (right) launch during the annual Plano Balloon Festival. 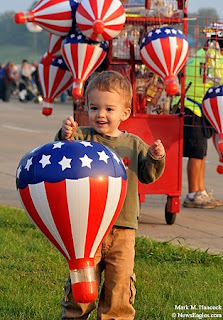 William Kirk, 2, of Plano plays with an inflatable balloon during the annual Plano Balloon Festival at Oak Point Park. 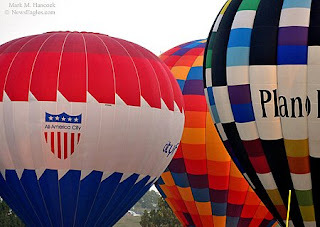 Plano-sponsored balloons inflate near each other during the annual festival. 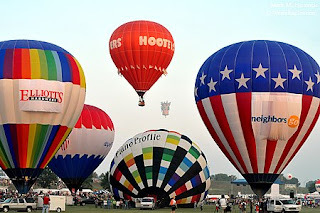 Many sponsored balloons featured special designs and shapes during the annual festival. 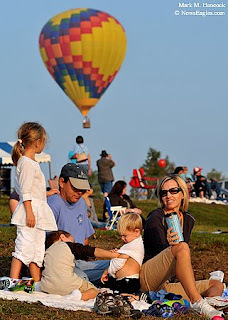 The Cargill family of Richardson has breakfast with the balloons. Family members include (from left to right) Megan, 5; Will, 4; Paul; Tad, 2; and Ericka. The Change of Pace (background balloon) is piloted by Winnie and Tim Durham of Weatherford. 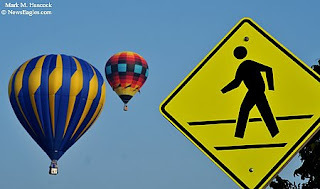 Beautiful Noise, piloted by Craig Hayes, (left) and Serenity Now, piloted by Bill Broker and Lance Terry of Frisco, (right) drift near a pedestrian crossing sign at Collin College during the annual Plano Balloon Festival at Oak Point Park in Plano. Some of my photo mosaics are on display this month at the Starbucks located at 4025 Preston Rd # 602 in Plano (near the southwest corner of Preston Road and Spring Creek Parkway). This is the first Dallas / Fort Worth metro showing of the pieces. They're available for viewing during store hours through October and into early November. The pieces currently showing are "The Cyclist" (1st place, illustration, NPPA Region 8 quarterly clip contest), "The Librarian" (Art of Digital international juried show in Los Angeles) and "The Guitarist." I've also displayed a signed copy of "Rita Captured" (Katie Award winner). Since the book wasn't distributed in Dallas and both runs sold out quickly, few people have seen it. The copy on display was autographed by all staff photojournalists at The Beaumont Enterprise. I'm working with Starbuck's management to arrange an on-location photo mosaic shoot, but we haven't established at date yet. Since I've never shown how I make these pieces, it might be interesting for some folks. If anyone wants to participate, I'll post a notice if we get the logistics and permissions worked out. The shoot itself takes at least three hours. I may do more than one piece if time allows. 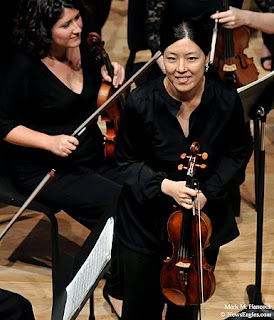 Concertmaster KeumHwa Cha takes a bow before the Meadows Symphony Orchestra performs "The Elements: Earth" in Caruth Auditorium at Southern Methodist University in Dallas on Friday, Sept. 19, 2008. 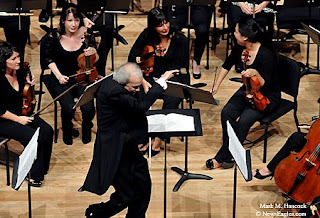 Paul Phillips bows with the Meadows Symphony Orchestra in Caruth Auditorium at Southern Methodist University. 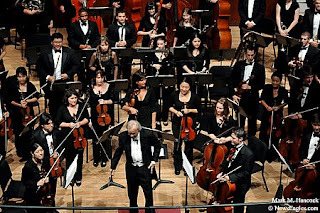 The Meadows Symphony Orchestra performs "The Elements: Earth" in Caruth Auditorium at Southern Methodist University in Dallas. 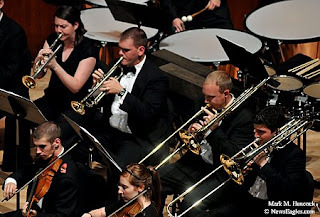 The Meadows Symphony Orchestra brass section performs during a concert in Caruth Auditorium. 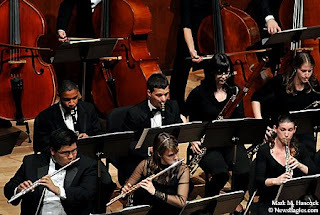 The Meadows Symphony Orchestra woodwind section performs during a concert in Caruth Auditorium. 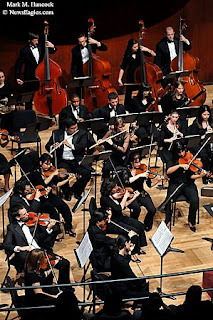 Paul Phillips returns to conduct an encore during a concert of the Meadows Symphony Orchestra. 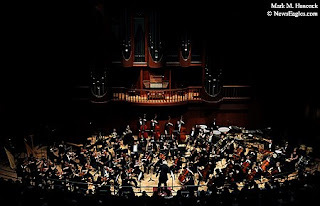 Paul Phillips conducts the Meadows Symphony Orchestra in Caruth Auditorium at Southern Methodist University in Dallas. Frisco's Julio Borbon (No. 2) swings at an Arkansas pitch during the Texas League Championship final baseball game at Dr Pepper Ballpark in Frisco on Monday, Sept. 15, 2008. 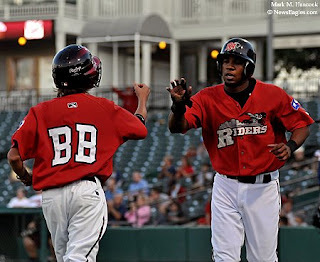 Frisco bat boy Jeremiah Skiba, 14, of The Colony high fives Elvis Andrus (No. 17, right) after Andrus scores the first run of the Texas League Championship final baseball game against Arkansas. 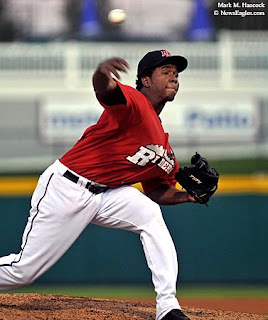 Frisco's Neftali Feliz (No. 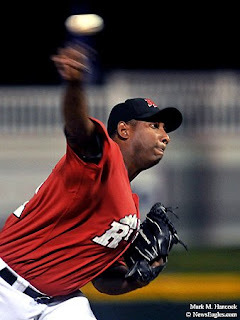 25) opens as pitcher against Arkansas during the Texas League Championship final baseball game. Frisco's Alfredo Gonzalez (No. 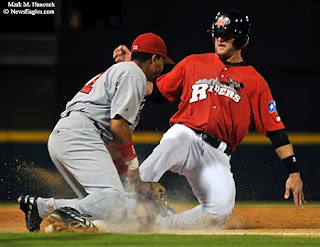 41) hurls a ball against Arkansas as the second pitcher during Texas League Championship final baseball game. Frisco's Chad Tracy (No. 27, right) drops the ball for an error as Arkansas' Ben Johnson (No. 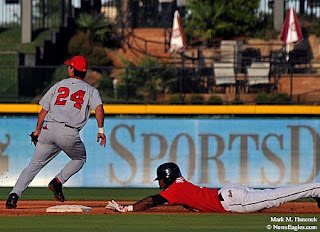 7, left) runs safely to first base during Texas League Championship final baseball game at Dr Pepper Ballpark in Frisco. 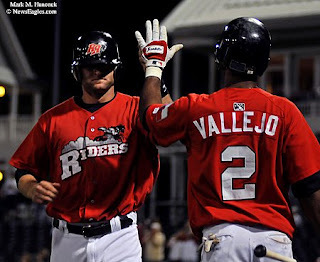 The Rough Riders lost the game, series and championship. 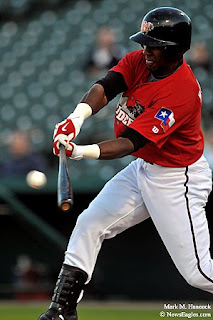 Please read, "RoughRiders lose Texas League final series"
Frisco's Julio Borbon (No. 2, right) dives to second base as Arkansas' Nate Sutton (No. 24, left) waits on a ball during a Texas League Championship baseball game at Dr Pepper Ballpark in Frisco on Sunday, Sept. 14, 2008. Frisco's Thomas Berkery (No. 20, right) scampers back to first base as Arkansas' Mark Trumbo (No. 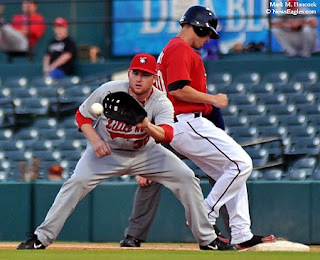 30, left) waits on a ball during a Texas League Championship baseball game. Frisco's Steve Murphy (No. 24, right) collides with Arkansas' Will Ortiz (No. 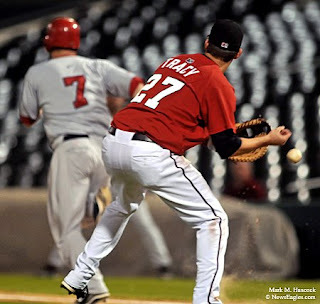 21, left) at third base during a Texas League Championship baseball game at Dr Pepper Ballpark in Frisco. Murphy scored the first run of the game on the next play. Frisco's Julio Borbon (No. 2, right) congratulates Steve Murphy (No. 24, left) after he scored the first run during a Texas League Championship baseball game against Arkansas. Frisco won the game 3-1. The deciding championship game will be played on Monday. Nevaeh Saltzman, 4, of Argyle tries to scare others participants during "Dinosaurs Alive!" opening day activities at the Heard Natural Science Museum in McKinney on Saturday, Sept. 13, 2008. 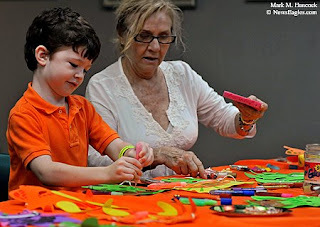 Major Murdock, 5, of Dallas (left) makes a mask with his grandmother Jeanie Garrett of Carrollton (right) during "Dinosaurs Alive!" opening day activities at the Heard Natural Science Museum. 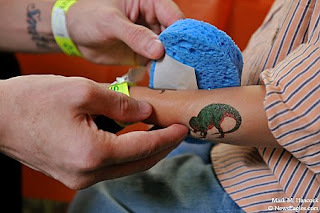 Pattrick Clark (left) applies a temporary tattoo on his girlfriend's son Caelan Rodriguez, 3, of Dallas during "Dinosaurs Alive!" opening day activities at the museum in McKinney. 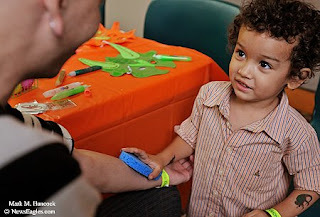 Caelan Rodriguez, 3, (right) applies a temporary tattoo on his mother's boyfriend Pattrick Clark (left) during "Dinosaurs Alive!" opening day activities at the museum. 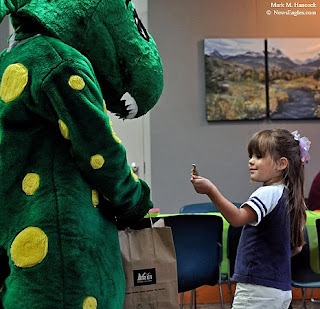 Maddie Nolan, 4, of Richardson (right) gets a toy dinosaur from volunteer Brad Northcutt as Tex, the Heard T-Rex, (left) during "Dinosaurs Alive!" opening day activities at the museum. Guests flee the rain as a Chasmosaurus remains in the woods during "Dinosaurs Alive!" opening day activities at the Heard Natural Science Museum. The Museum's new "Dinosaurs Alive!" 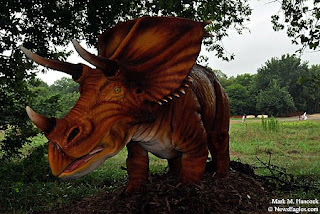 exhibit features a walking trail with life-size animatronic dinosaurs. 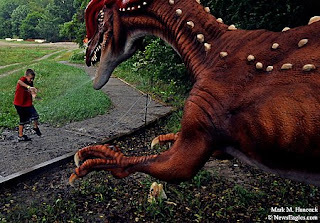 A Dilophosaurus waits for victims during "Dinosaurs Alive!" opening day activities at the museum. The trail features nine life-size, animatronic species. Connor Harmon, 10, of Crossroads gets sprayed with simulated poison (water) by a Dilophosaurus during "Dinosaurs Alive!" opening day activities in McKinney. 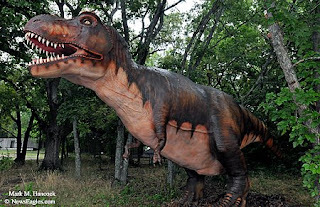 A 50-foot-long by 17-foot-high Tyrannosaurus Rex roars during "Dinosaurs Alive!" 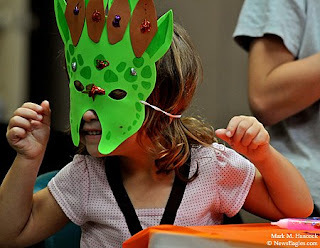 opening day activities at the Heard Natural Science Museum in McKinney. The Museum's new "Dinosaurs Alive!" 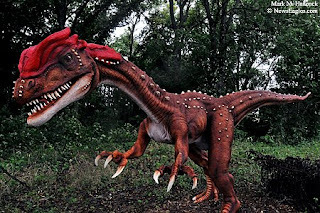 exhibit features a walking trail with life-size animatronic dinosaurs. The animatronic T-Rex dinosaur gave me a new perspective on these critters. The exhibit lets you see how big they are in comparison to yourself. If you think about them moving with the same quickness of a bird (a turkey skull is essentially a miniture version of a T-Rex skull sans teeth), you realize how fast a human could be a snack. Kitchen Dog Theater performs "The Pillowman"
Dallas Theater Center performs "The Who's Tommy"